Walking down Central Park West from the north end of the park, it’s hard to miss the castle-like structure on the corner of 105th Street. 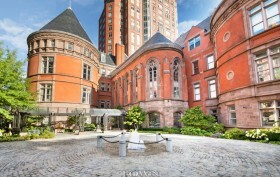 The facade is dominated by great conical towers, majestic turrets, deep red brick, and a soft Belleville brownstone. A closer look reveals stained glass windows and intricate stonework, all convincing details that someone went out to build a fairy-tale castle on the perimeter of Central Park. Among the surrounding townhouses and co-op buildings, it’s a stunning piece of architecture that looks like it doesn’t quite belong. 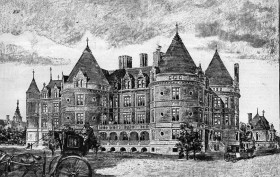 Indeed, the story of how this building, constructed at 455 Central Park West in 1887, still stands is an unlikely one that is rooted in medical history–a dark medical history, at that. This was New York’s first cancer hospital, and the first hospital in the United States dedicated specifically to its treatment. This was a time when cancer treatment was unfamiliar to most doctors–in the back of the castle was a crematorium and smokestack that was often in use. After the hospital’s closure in 1955, it became a notorious nursing home known for mistreating its patients. When investigations caused the nursing home to close in 1974, the building was left to rot. Not until a redevelopment plan took off in 2000 was it restored into a luxury condo development. Today, despite its grim past, it remains an important piece of New York’s medical and architectural history.